We are taking a few minutes this week to bring everyone up to speed on the developing shale formations throughout the West Texas area. Our focus is not only due to our Austin roots, but to also highlight the abundance of drilling activity and current oil reserves for these exploding shales and their dominance in these areas compared to any other state in the US. We have recently highlighted the tremendous investment and expansion of drilling in the Eagle Ford Shale area. 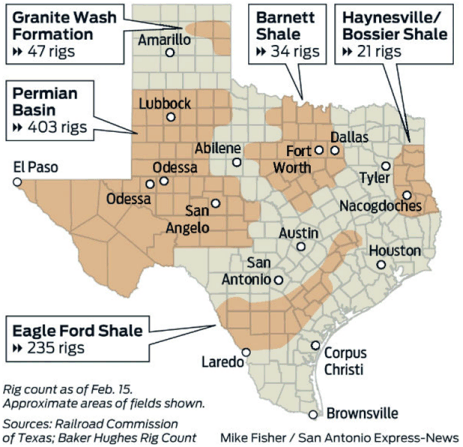 Another significant oil producing shale has begun to exceed Eagle Ford and other high producing shales. The Cline Shale, also known as the Lower Wolfcamp, is creating a stir in the West Texas area. It is estimated the oil reserves in this area could exceed the Eagle Ford Shale and the Bakken Shale combined. With estimated reserves at 30 billion barrels of oil (bbl)1, The Cline Shale is leading the pack in future production estimates. The Cline Shale formation runs about 140 miles north to south and about 70 miles wide through Howard, Glassock, Reagan and Sterling counties in Texas. The Cline reservoir of oil is believed to be 200 to 550 feet deep, the equivalent of 10 Eagle Ford shales stacked on each other. The shale contains 85 percent oil and liquids-rich gas. The measurement of proved oil reserves are those quantities of petroleum which, by analysis of geological and engineering data, can be estimated with a high degree of confidence to be commercially recoverable from a given date forward, from known reservoirs and under current economic conditions. The oil reserve estimates are impressive and coincide with the current drilling activity explosion in the area. Currently Texas ranks high in the world in the number of drilling rigs in operation with more than one-fifth of the world’s rigs. The Permian Basin, home to the Cline Shale, currently has over 400 rigs in place which is almost double to the Eagle Ford Shale count at 235. As is seen in the Eagle Ford Area, this forecasted and current production of oil is gearing the surrounding counties to prepare for a boom. Housing, restaurants, business operation space and other resource planning is already taking place. As oil companies continue to enter the area, the crews required to run these operations need living accommodations. Options are varied, from hotels to work camp mobile units where each have been utilized in other developing shale areas and are being considered in the Permian Basin. At Falcon Containers, we are excited to report on and be a part of this exciting news. Our own company has provided work camp solutions for the drilling activity in Eagle Ford Shale area and others with the use of repurposed shipping containers. With modifications, these structures can be transformed into entire living units to accommodate temporary work forces at the site of drilling activity.